Lucas Tse (謝振軒), son of Cecilia Cheung (張栢芝) and her former husband Nicholas Tse (謝霆鋒), turned 8 years old on August 2. Cecilia hosted a party for Lucas a day before his birthday. Cecilia’s friends were also invited to the gathering, including actress Pinky Cheung (張文慈), who gave Lucas a collection of Lego PS4 games as his birthday gift. Cecilia took many photos at Lucas’ party and shared them online. Lucas had two birthday cakes, in which one was designed to look like a tablet. 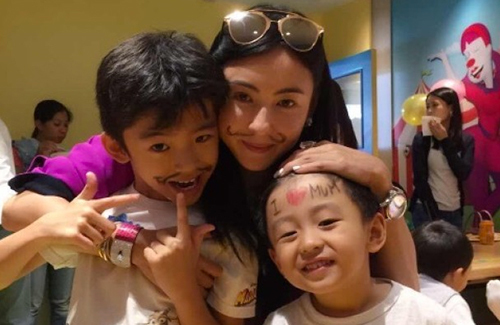 In another picture, Cecilia, Lucas, and his younger brother Quintus Tse (謝振南) were sporting a classy mustache, which were drawn on their faces. Lucas’ mischievous appearance resembled Cecilia in the 2001 comedy film Shaolin Soccer <少林足球>. Quintus also painted “I love Mum” on his forehead. Receiving many toys, video games, and a cake designed to look like an iPad, it appears that Lucas is quite a big fan of video and computer games. His father, Nicholas, was not at the birthday party, but it is believed that Nicholas will celebrate his son’s birthday at another time.